Free Speech Advocates, Publishers Wrestle With Questions Of Censorship Simon and Schuster's book deal with controversial Breitbart editor Milo Yiannopoulos drew strong criticism online, and sparked a debate on publishing's role in limiting the availability of ideas. 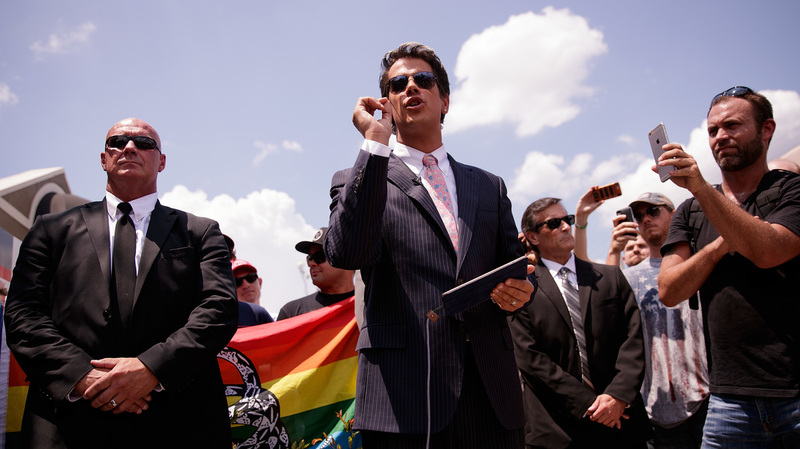 Publisher Simon & Schuster drew strong criticism after signing conservative provocateur Milo Yiannopoulos — seen here holding a press conference about the Pulse nightclub shootings. Free speech advocates see President-elect Trumps's testy relationship with the media and his middle-of-the-night tweets reacting to critics as evidence that he is — at best — insensitive to the First Amendment. And they say one recent controversy, the decision by Simon & Schuster to publish a book by social media provocateur Milo Yiannopoulos, has grown out of an atmosphere that encourages hate speech. Now, PEN America — an organization dedicated to defending the right to free speech all over the world — is starting to pay more attention to what's happening on the home front. PEN is co-sponsoring a protest which will bring a host of well-known writers to the steps of the New York Public Library to protest threats to free expression. "We need to be, as citizens, ready to come out," says PEN America executive director Suzanne Nossel, "stand together for basic rights that six months ago we might have been able to take for granted, but that we no longer can." Nossel sees these threats coming from several directions: The President-elect's attacks on the press and his critics, the proliferation of fake news and the pattern of trolling on social media. "People feel more free to speak their mind," she says, "even if it crosses what would have been considered boundaries of hatred or racism or misogyny, and so I think it then becomes incumbent on others to speak more loudly." But the job of advocating for free speech has become ever more complicated in the age of social media — which Nossel says can be both an incredible tool for free expression and a threat to it. "It has a dampening effect on the depth of discourse, it can lead to this online mobbing and trolling where someone who says something controversial is then targeted, ridiculed. So this is not about the government silencing speech, but it's about speech silencing other speech." Trying to suppress hateful speech doesn't make it go away. "What the left wants to do is it wants to enable its extremists on its own side, the sexists and misandrists of feminism, the black supremacists of Black Lives Matter, they want to enable extremists on their own side, and silence the extremists on the other. Well, I don't like the extremists on either side." "Nobody in the protest is saying 'you have no right to be published,'" he says. "'You have no right, Simon & Schuster, to publish this guy, and this guy, you have no right to be published' — nobody's saying that. What they're saying is, 'we're shocked and we're outraged that you would stoop so low to make a buck as to publish this purveyor of vile hate speech.'" This is not about censoring right wing voices. This is about combating hate speech and its entry into the mainstream. Johnson is highly critical of a statement issued by the National Coalition Against Censorship on behalf of a number of industry groups representing publishers, authors and booksellers. The NCAC says anyone has a right to call for a boycott of Simon & Schuster — but that such a protest will have a "chilling effect" on publishing. Joan Bertin, executive director of the NCAC, says similar protests have already led to censorship: "We know of instances in which books that contain certain kinds of content have been shelved, deferred, redacted, edited deeply to remove content that people might object to." Both the NCAC and PEN America say the best response to hate speech is not more censorship. "Trying to suppress hateful speech doesn't make it go away," says Bertin. "I mean, I think the whole idea of free speech requires us to be active participants, and when we hear ideas that we think are bad and harmful, it requires us to say 'why,' not just say 'shut up.'" But publisher Dennis Johnson says another equally important right is at stake here: The right to protest. "This is not about censoring right wing voices," he says. "This is about combating hate speech and its entry into the mainstream."